Relieve your arms and keep your equipment dry with this DJI Ronin-S Kit put together by B&H. The Ronin-S stabilizer gimbal for DSLR or mirrorless cameras comes with a variety of accessories such as cables, a battery, a power supply, mounts and supports, and a focus wheel. The Easyrig Minimax support vest redistributes the weight from the Ronin-S and relieves the strain on your arms. The Quick Release Camera Hook replaces the original hook on the Minimax upper arm to you can quickly mount and unmount your camera. The included Minimax Umbrella with Holder mounts onto the upper arm of the Minimax and protects you and your camera from sun or rain. The Quick Release Camera Hook from Easyrig is designed for holding your camera securely with little setup time when using any of the Easyrig camera rigs. The Quick Release Camera Hook has a load capacity of 255 lb and comes with two 3/8"-16 and two 1/4"-20 ball studs which can be fastened to a camera, camera cage, and camera handle. Box Dimensions (LxWxH) 6.8 x 4.1 x 1.95"
Ronin-S with Easyrig Minimax, Quick Release Hook, and Umbrella Kit is rated 4.2 out of 5 by 210. How does this work? Where does the EasyRig attach to the Ronin?? 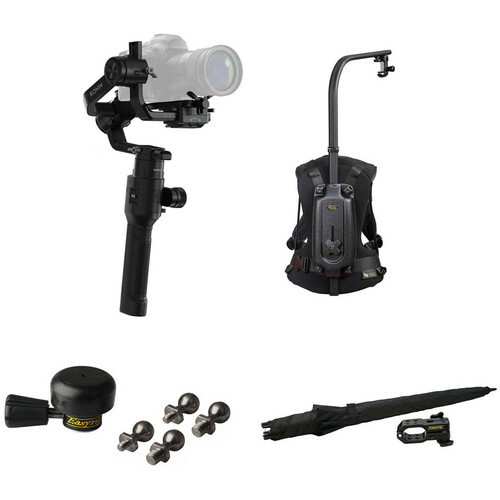 This kit comes with the Easyrig Quick Release Camera Hook, B&amp;H # EAERIGEA033Q, which you would connect to a 1/4&quot;-20 or 3/8&quot;-16 thread on the Ronin-S for a connection to the Easyrig. Does it have dtap power out? We're afraid not. The Ronin-S does not offer a D-Tap power port. Is the DJI Ronin-S compatible with the Lumix dmc-gx8? According to the latest information from DJI they are working on a USB Shutter Control for the Canon 80D that will offer more control over the camera when using the Ronin-S. Does the USB-C control cable allow Olympus OM-D E-M1 Mk II shutter release? Olympus cameras are not currently supported when using the included USB cables on the Ronin-S. However you should still be able to balance and shoot with the camera on the gimbal.